Martial arts brawler Absolver drops today, a mix of kung-fu and Souls games from developer SloClap. It’s a deep game that can be pretty hard at times. Here are some tips and tricks that will help you on your road to absolution. Pick a class that suits you. At the outset of Absolver, you can choose from three different schools of training. Each has their own skillset and flow, but most importantly, each has a different defensive tool. Forsaken can parry blows, while Kahlt absorb hits and Windfall avoid and sidestep attacks. You can gain moves and skillsets from the other classes later, but you’re going to want to master one early. If you’re unsure or new to fighting-style games, Kahlt gives you the most straightforward options. Souls players will likely enjoy the Windfall’s dash, reminiscent of Bloodborne’s quick side-steps, while fighting game players will probably look towards the parry of the Forsaken to punish repetitive combos. The moves you can use in Absolver are determined by the stance of your avatar’s hips. While one button may be jab in the forward-left stance, it might be a backhand or low-kick in the backward-right position. Just like learning your buttons in a fighting game, you want to be aware of what move will come out when you hit a certain button, so you don’t get caught whiffing a big kick when you wanted a quick poke. The best way is to watch your opponent’s facing between flurries. In the heat of the moment it can be difficult, but if they tend to return to a certain stance to start a combo, you can start to read how that combo is going to come out and react accordingly. Your only meter for this is the character model, but knowing that your opponent likes to sweep-kick from the back-left stance is a good start to comprehending their move set and fighting back. Get to know your combat deck. 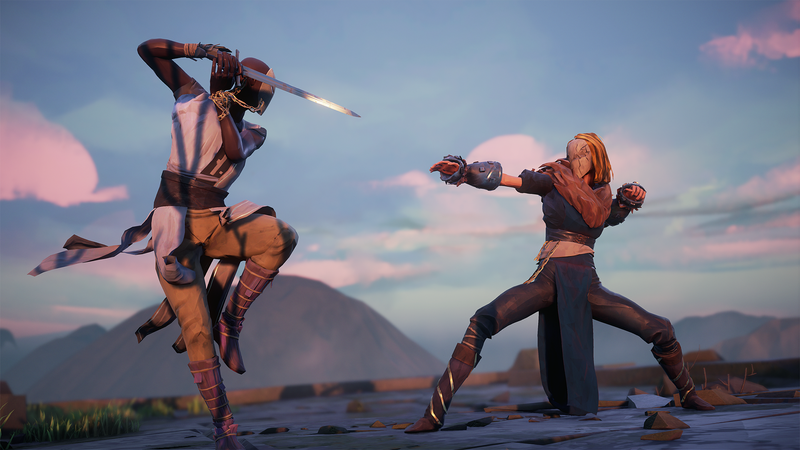 Absolver’s combat revolves around the combat deck, your flowchart of attacks that branch and intertwine with each other to form your own personalized style. Even with the basic starting tools, it’s important to understand how these moves flow into each other. Knowing which moves will naturally rotate your stance is how combinations start to form. The built-in practice room, accessible from your Meditation screen, is a great place to practice your moves and tweak your combat deck. The practice room dummy lets you hit a real opponent and practice your moves as much as you want, so you can really get a feel for how certain moves flow together and feed into other stances. Put some points in your stamina and health. With every level comes a fresh point to drop into your stats, along with a choice to make. As tempting as it is to pour points into your class’ main source of damage (Windfall, for example, is Dexterity), put some of your first points in health and especially your stamina. Every move, block, and attack is metered by your stamina, so having more lets you do more. It will come in handy when you get pushed back into a corner by multiple fighters and need to hold back a barrage before fighting your way out of it. One of Absolver’s go-to methods for ramping up difficulty is to add AI-controlled basic fighters to boss encounters. Even when boasting a low health-bar, these random prospects can create a problem when they gang up on you, so learn to play patiently and be mindful of your positioning. Be aware of your surroundings, rotating your focus and attention to whichever fighter is on the offensive. Every fighter in Absolver has an arsenal of moves roughly equal to a basic starting character, from all three classes. It might be tempting to run past the shrimp on the way to the next big fight, but spending some time taking down the nameless minions can teach you some new moves. Each block or defensive option used against a move you don’t know helps you gain knowledge of it, indicated by a picture of the move and a progress circle. Over time, you’ll learn the move and can add it to your cache of attacks. Some of my favorite moves, like the casual head-slap, were gained by finding random brawlers who used them, or players who were willing to hit me with them repeatedly until I learned them. Tension builds up during fights, indicated by the fragments on the back of your character. You can think of these yellow fragments as your super meter, which can be expended on abilities or to summon a weapon. It’s a way to turn long battles back to your favor, and identifying the right tools for the right job will help you overcome more difficult fights. Exhaust is very effective in one-on-one duels, but Earthquake will help you control a crowd. Heal is pretty much required in most cases, and weapons can add a bit of damage and confuse your opponent with a new moveset to deal with. Though I mainly used my tension shards as a meter for gaining health back in long fights, sometimes a well-timed Exhaust or Earthquake were what gave me the edge I needed to cut down the swarm of enemies facing me, or slow the offense of a relentless opponent. In multiplayer, smart use of tension can make the difference between a round won or lost. While you can initially only choose from three classes, a fourth class is hidden away. During your time in Adal, you might notice some fighters who sway and use moves others don’t. Once you reach a high enough level, a special foe will spawn in the Tower of Adal. Beat him and you can unlock a gate in the colosseum that hides a mentor for the Stagger style, a drunken-fighter style that adds some interesting new moves to your repertoire. Don’t be afraid to work together. Absolver uses an open, drop-in and out online system, which allows random players to wander into your game. Some might decide they want to fight you, while others will go on their merry way. You can use the chat wheel to request co-op sessions with players to get through some of the game’s tougher bosses, or you can spar with them to learn new moves. Absolver gets more interesting when players are throwing monkey wrenches into the mix, so don’t be shy! If you’re butting your head against the same Marked One or can’t seem to beat the enemies in one area, move to another. To reach the final challenge and graduate from Prospect to Absolver, you have to beat all the Marked Ones and bosses—there is no order you have to fight them in, however. If one is particularly troublesome, go fight another. I’d recommend heading to the colosseum early to get the skills there. Exhaust is very handy against both groups and single fighters, as it drains their stamina at a considerable rate. After you’ve cleared the main story, most of what’s left to do is either levelling up your character or participating in combat trials. These start out as one-on-one bouts against actual human players, but can escalate into more difficult versions of bosses and other challenges. The best way to start to really improve is to fight a human opponent, who isn’t as exploitable as the AI and will start to find gaps in your combos. The end-game content of Absolver is largely PvP-focused, and using the altars to enter into combat trials is one of the best ways to prepare for the toughest challenges the game has to offer.